For me, cookbooks are one of life’s true joys. Opening a new cookbook is an insight into a whole world of culinary delights, and it is also a challenge. Can I ever make a dish that tastes and looks as appetizing as the one on the page? The answer is often no, but that shouldn’t discourage you. Cooking is an art, and art is highly subjective. I recently acquired the River Cottage Meat Book. 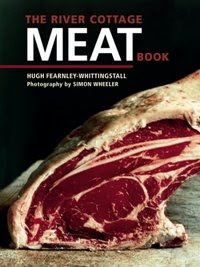 Written by Hugh Fearnley-Whittingsall, this cookbook is more than a simple collection of recipes; this is a tome for all things meat, and belongs in every good foodie’s kitchen. You know that it’s the real deal when the cover is adorned with the James Beard cookbook of the year award. After perusing the recipes, I came across one that I thought would be relatively easy and well received by my guinea pigs: pan-to-oven pork chops with garlic. It reads as a study in simplicity with an ingredient list that is only five items long. Like all recipes in this cookbook, the focus is really on the quality of the meat. I thought that I would give pork chops from Wilson’s Meat Market a try. A far cry from free range, organic fare, but it was short notice, and it’s good pork for being mass production. While I waited for the pork to defrost, I went to work on the garlic. Work is really the wrong word in this instance as all I did was break the bulb into individual cloves. The recipe says to leave the paper on to protect the garlic from the heat. That’s two medium sized bulbs; I wish all recipes called for whole unpeeled garlic. Next step was heating the pan in the oven and frying the garlic in some olive oil. By the way, if you say “e.v.o.o.”, you should really go ahead and end yourself, please! Do it for the sake of the gene pool. Also seasoning liberally with fresh ground pepper and good salt, I only use sea salt or kosher salt. If you’re only using iodized salt, I pity you. After searing, I took the rocket hot pan from the oven and placed the pork chops inside. They were met with a delightful sizzle. Deglazing a pan is underappreciated step in many recipes. Without it, you lose all that delicious fond and flavoring. I had asked my dad for a nice white, but after he read the recipe, he talked me into cider. My cider to be exact, and it had a dry crisp taste that worked well with the pork and garlic. Deglaze the pan, cover the chops with the garlic and then pour it all in to make a nice pan sauce. After deglazing and garlic addition, this is what I put in the oven. It looks pretty tasty as is. A good 20 minutes later, I ended up with this. Now it’s not as crispy as the dish that was pictured, but I didn’t care. After the first bite, I was sold. There’s nothing quite as sublime as a good cut of meat working with garlic and alcohol in perfect harmony. Would I make this dish again? Of course, would I change the recipe? Again, of course, I’m curious how a white would taste in comparison to the cider. Not only would I change that, but I would try some of the variations Mr. Whittingsall was kind enough to list. So what’s the final word? The book? Excellent. The recipe? Excellent. The taste? Off the charts. It’s always a pleasure to take a recipe and bring it to life, especially when the recipe is as good as this one.